Goodreads: Reluctant midwife Emma Trimpany is just 17 when she assists at the harrowing birth of the Dionne quintuplets: five tiny miracles born to French farmers in hardscrabble Northern Ontario in 1934. Emma cares for them through their perilous first days and when the government decides to remove the babies from their francophone parents, making them wards of the British king, Emma signs on as their nurse. As the fight over custody and revenues turns increasingly explosive, Emma is torn between the fishbowl sanctuary of Quintland and the wider world, now teetering on the brink of war. Steeped in research, Quintland™ is a novel of love, heartache, resilience, and enduring sisterhood—a fictional, coming-of-age story bound up in one of the strangest true tales of the past century. 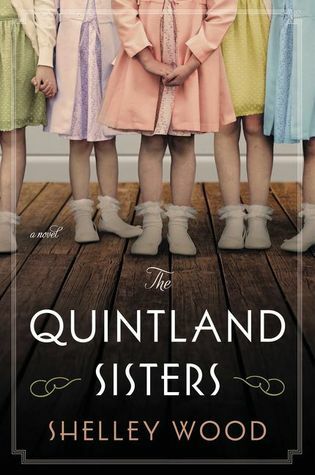 Kritters Thoughts: My absolute favorite genre is historical fiction that takes a narrow focus on a time, place or event and educates me without me even knowing it - The Quintland Sisters was just that. Five identical daughters are born to a small town farming couple who already have five children to their name and the doctor that helped bring them into the world sees them as a cash crop. He sequesters the girls in name of keeping them healthy and safe and ends up selling them as an exhibit in this small town in Canada. It was so interesting to see how they could make a profit on children and thinking about that in the modern sense. I read in a review after reading this book about someone saying that this was almost the first reality family as they were made famous just for being the family that they were and I sat and thought on that and how these girls didn't have a hope for a "normal" future because of the way their childhood was so not normal. I had no clue about this family and loved that I had taken a peak at the author's note in the end to know from the beginning that this was a true family and close to the truth story. How interesting that these five girls were born at this moment in time and were able to get the attention of both Canada and America and really became famous just for being born. I loved how there were interesting historical moments peppered within the story to give it a little more perspective. I loved this book and wouldn't mind a sequel that gives a glimpse of this family a little later in life and see how the girls go through puberty, college and adulthood.